There is no greater joy than sending beach photos to relatives during the holidays while they’re up north freezing their wits off. Aside from this Christmas pastime, there are more Key West traditions that put locals and visitors in the (island) holiday state of mind. Here are some activities you can’t miss out on this 2017 holiday season. Other cities and towns have ice skating around Christmas time, but in Key West we “deck the hulls” for this annual holiday boat parade. The procession begins at 8 p.m. on Dec. 9, with viewing along the Harbor Walk of Lights and the Historic Seaport. 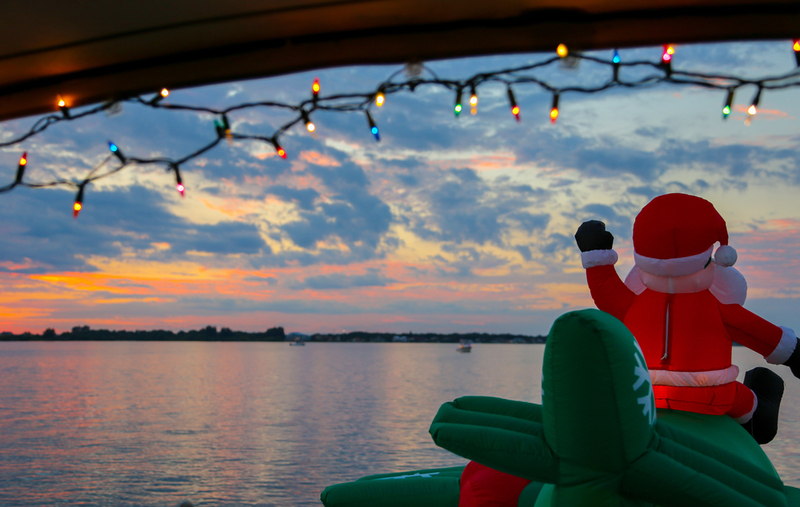 Boats of all sizes are decorated with lights, precision and care to impress spectators, but, most importantly, the judges at Schooner Wharf Bar & Galley, as there’s over $20,000 in prizes and raffles up for grabs. Arrive to the Key West Bight early to take in holiday music, shopping and dinner. More info here. Want to see all the cute Key West homes in all their lighted glory? The Holly Jolly Holiday Tour is good for the whole family. The hour-long tour is presented by the Old Town Trolley and has tours beginning at 6 p.m. from Mallory Square in December. Cookies and cider will compliment your open-air Old Town tour of Christmas lights throughout the island. Buy tickets in advance and get more info here. You don’t have to be trapped inside of a mall to do your Christmas shopping. The Harbor Walk of Lights kicks off Nov. 22, with the Harbor Walk at Greene and Elizabeth Streets completely lit-up in pure island fashion. The Fishing Buoy Christmas Tree will be lit, as well as the Lobster Trap Christmas Tree and Nautical Christmas Tree. You can’t see this kind of stuff anywhere else. The Harbor Walk of Lights will be lit until New Year’s Eve. Visitors can enjoy local shops, eats and drinks on the harbor while taking in the holiday spirit. For a small-town local feel, the hometown holiday parade features local high school bands and floats on Dec. 2 at 7 p.m. The parade starts at Bayview Park and continues down Duval Street to Eaton Street.